It was another stunning day of shooting at Dreams Tulum Resort & Spa! The editorial and creative teams at Bridal Guide Magazine are so creative! Take a look at how they paired fashion, location and accessories to create looks that are totally glam…with a retro vibe. Beach bombshell. The lifeguard stand was the perfect prop for this 50’s style gown. Very fun and flirty. This shot included a classic all-American look with red shoes, white dress, blue pool and an old fashioned bottle of Coca-Cola. 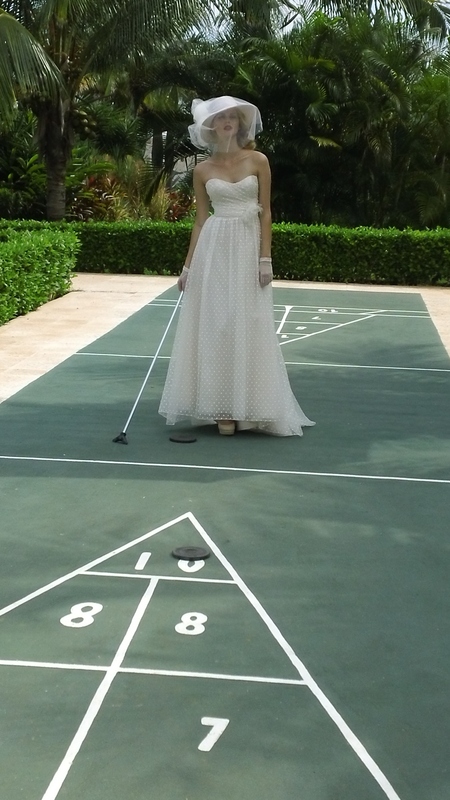 A stroll down the aisle…or shuffle board court. This shot had a very “Alice in Wonderland” feel with the resort’s oversized chess board as the setting. And notice the shoes…no bride’s look is complete without a pair of Dreams slippers! Everyone was in love with this dress…and the look is very fitting for a destination wedding. That’s a wrap for day two! For the 3rd day of the shoot, the Mexico Tourism Board arranged for us to shoot at Xcaret (Riviera Maya’s top eco archaeological park). The theme for the looks will be very whimsical, and we are so excited to see how it turns out because the model will be posing with a flock of flamingos. Let’s hope they aren’t divas on the set! Check back tomorrow to see…. This entry was posted in Dreams Tulum and tagged Bridal Guide Magazine, Destination Wedding, fashion shoot, Mexico, Mexico Tourism Board, retro glam weddings, Xcaret. Bookmark the permalink. Whether hair is straight or curly, it might be hard to style in the summer because of all that humidity. Many brides-to-be are faced with daily frizz, and fly-aways. It’s best to not fight with your hair, but instead treat it with love and care. Smoothing conditioners will seal the hair cuticle and prepare it for styling, while smoothing serums will tame stubborn fly-aways. There is no point in piling on product that will leave your hair oily and limp. Less is more is key for maintaining your style throughout the day, and a little hairspray will be sure to keep your tresses in place. Beautiful Resort producing Beautiful Pictures! Romance Travelers.com has had the pleasure over the past 14 years to have many bridal couples pick Dreams Tulum and now the newer Dreams Riviera Cancun and Now Jade resort to have their destination wedding. All have come back with glowing feedback, and have returned for their anniversary. Besides the great service is the excellent wedding packages, under $3000 for 20 people with a four course meal, cocktail party, both with open bar, flowers, wedding cake, pictures and even live music. Tell me where in the U.S. can you find that deal. Combine that with 24 hour room service, daily stocked mini bar, no reservations for dining, no tanline wristbands and great service! Cannot wait to see the pictures in print!